A couple of months ago I was given a couple of chickens that someone did not want as they were moving and I am unsure what they are. Anyone know from the pic? I know they are bantams, are they pekin bantams? Doesnt look like it to me. Do they have feathered feet? wyndotte, pekin indian.......?.something you might get in my yard. Yes the feet are feathered, fluffy feathers actually. triple comb, dark hackles = indian. spangled breast and partridge type feather = eb = wyndotte?? needed to know its colour as a chick. but all is guessing....just a from experience. She looks like a cross breed to me (but I'm no expert on breeds) but I love her colour. She is sooo pretty! That is a very nice color/combination. Thanks guys that helps. They are good layers but will not come anywhere near me even when I have food. Not at all like my other chickens! Maybe one day the will get used to me. 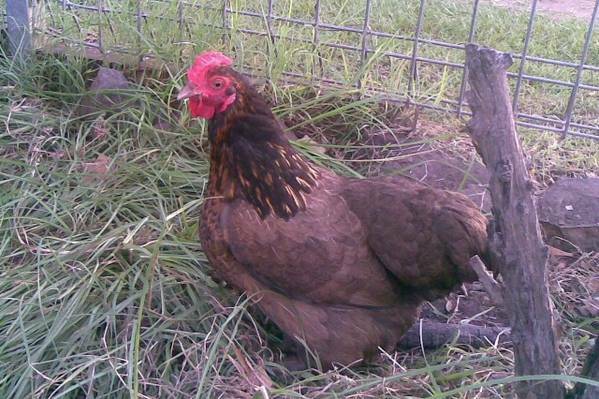 It looks to be a wyandotte crossed with a pekin. Thats wat i think anyway.